Over the past few years, Hardwick, Vermont, a typical hardscrabble farming community of 3,000 residents, has jump-started its economy and redefined its self-image through a local, self-sustaining food system unlike anything else in America. Even as the recent financial downturn threatens to cripple small businesses and privately owned farms, a stunning number of food-based businesses have grown in the region. The Town That Food Saved is rich with appealing, colorful characters, from the optimistic upstarts creating a new agricultural model to the long-established farmers wary of the rapid change in the region. Hewitt, a journalist and Vermonter, delves deeply into the repercussions of this groundbreaking approach to growing food, both its astounding successes and potential limitations. The captivating story of an unassuming community and its extraordinary determination to build a vibrant local food system, The Town That Food Saved is grounded in ideas that will revolutionize the way we eat and, quite possibly, the way we live. 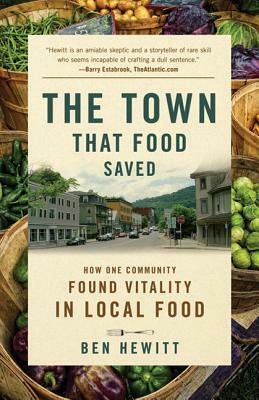 BEN HEWITT is the author of The Town That Food Saved, and the upcoming Making Supper Safe, and articles for magazines such as Bicycling, Discover, Gourmet, Men's Journal, National Geographic Adventure, Outside, the New York Times Magazine, Yankee and many others. He and his family live in a self-built, solar-powered house in Cabot, Vermont, and operate a 40-acre livestock, vegetable, and berry farm.